Here at SGS Engineering we have a broad selection of H frame presses for sale that are excellent for bearing, bushing, straightening, bending and many more purposes. We manufacture our own range that are perfect for any garage or workshop as well as supplying a variety of Power Team H frame presses. 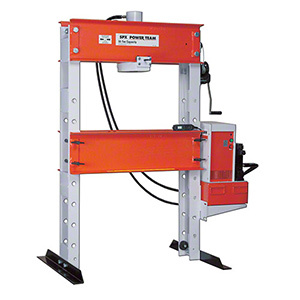 Whether you need one for dealing with heavy duty tasks or just require accuracy when undertaking smaller jobs, you’ll easily find an H frame hydraulic press that meets your needs in our selection. Take a look through the products available online to find the next addition to your personal or professional workshop. Named after its upright shape, an H frame press is an upright appliance that generally requires a small amount of floor space to install (although smaller items can be bench mounted). From our smaller 10 ton H-frame bench mounted press to our massive floor mounted 200 ton H frame presses, there are options for those working on small scale personal jobs to professional industrial applications. The hydraulic power makes undertaking any bit of work almost effortless. They can be used vertically or horizontally depending on what kind of pressing job you are working on. Each one we have available is strong and sturdy, guaranteeing quality and able to deliver accurate results whatever your aims may be. Browse our collection and pick out an H frame hydraulic press that will meet all your requirements. 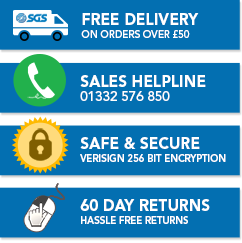 If you need it quickly then make the most of our next day delivery service, or for further advice visit our help centre to ensure you make the best informed decision when it comes to your new H frame press.